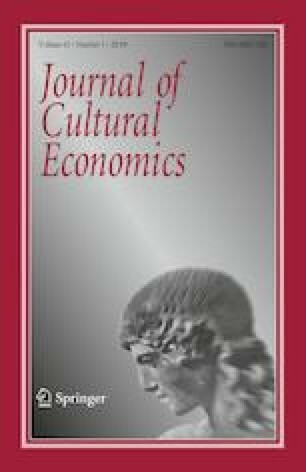 The aim of this paper is to infer the spatial extent of agglomeration economies for the creative service industries (CSI) in Barcelona and its relationship with firm performance controlling for urban characteristics and demand factors. Using micro-geographic data from the mercantile register for firms between 2006 and 2015, I estimated the effect of intra-industry and inter-industry agglomeration in rings around location on productivity in Barcelona. The main results are: (1) for CSI, at a micro-spatial level, localisation economies are important within the first 250 m; (2) for non-CSI, having employees in the CSI in close proximity (250–500 m) enhances their productivity; (3) for symbolic-based CSI firms, localisation economies—mainly understood as networking and/or knowledge externalities—have positive effects on TFP at shorter distances (less than 500 m), while for the two other knowledge-based CSI (i.e. synthetic and analytical) localisation economies seem not to be so important; and (4) market potential does not offset localisation economies for CSI. These results strongly suggest the importance of agglomeration externalities in CSI, which are strongly concentrated in the largest cities. This paper was partially funded by ECO2013-42310-R, ECO2014-55553-P, the “Xarxa de Referència d’R+D+I en Economia i Polítiques Públiques,” the SGR programme (2014-SGR-299) of the Catalan Government, the “Departament d’Universitats, Recerca i Societat de la Informació de la Generalitat de Catalunya” and the “Fundación SGAE.” I would like to acknowledge research assistance by M. Lleixà and D. Siles, the helpful and supportive comments of J.M. Arauzo, M. Manjón and A. Moreno and the participants at the 5th Workshop in Industrial and Public Economics, the 19th INFER Annual Conference, the 2017 Edition of the Summer School in Urban Economics, the 57th ERSA Congress, the AQR Lunch Seminar (UB), the XLIII Reunión de Estudios Regionales and the Geoinno 2018. I also would like to thank two anonymous referees by their valuable comments. Any errors are, of course, my own. See Tables 5, 6, 7, 8. Ajuntament de Barcelona. (2015). Barcelona en xifres 2015. Principals indicadors econòmics de l’àrea de Barcelona. Barcelona Activa. https://www.slideshare.net/barcelonactiva/barcelona-en-xifres-2015. Coll-Martínez, E., Moreno-Monroy, A. I., & Arauzo-Carod, J. M. (2018). Agglomeration of creative industries: An intra-metropolitan analysis for Barcelona. Papers in Regional Science, https://doi.org/10.1111/pirs.12330. IERMB. (2013). Informe Barcelona Metròpoli Creativa 2013. Economia del coneixement i economia creativa a Barcelona. Document de Síntesi. Ajuntament de Barcelona. http://barcelonadadescultura.bcn.cat/informe-barcelona-metropoli-creativa-2013/.